In many households there’s never a good time to clean up the family computer, because somebody’s “always” on it. Except maybe late at night, and then perhaps it’s shut down to save power or wear. So if you want to have something run automatically, it’s hard to find a time when nobody will be using it. Well, there’s a simple solution in most LDS households: during Church. It’s as close to a perfect solution as you’re going to get. Church occurs each week at the same time. Everyone should be at Church and away from the computer. And it’s a 3-hour block of time. But there’s one problem: you, the go-to computer person in the family, is also at Church! That’s where the scheduling comes in. Just schedule the cleanup tasks to run while everyone’s at Church. So what should you do? 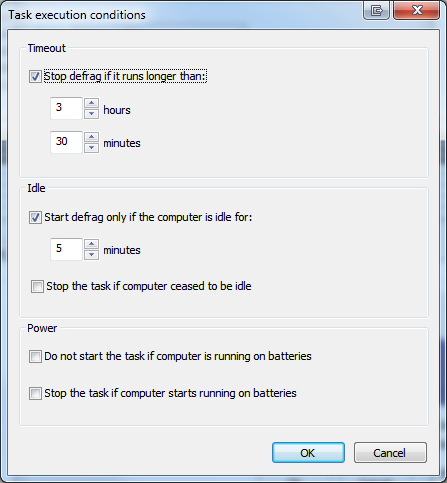 One thing that helps many Windows computers run faster is defragmenting the hard drive. “De-whatting the huh?” Your hard drive is where all your data is permanently stored: from the files programs need to run, to your personal photos, documents, and more. Some files are large, and some are small and they get put on there haphazardly. Over time the files become “fragmented.” This is not good because it takes longer to read a file, when one piece is in one spot, while another is clear across on the opposite side. Imagine a page from a book. Pretend the a sentance starts on the top-left-hand-corner where it should, but half-way through the sentence, it’s cutoff and a new sentance begins. The other half of that sentence is somewhere near the bottom of the page, jumbled in with the 2nd half of several other sentences. 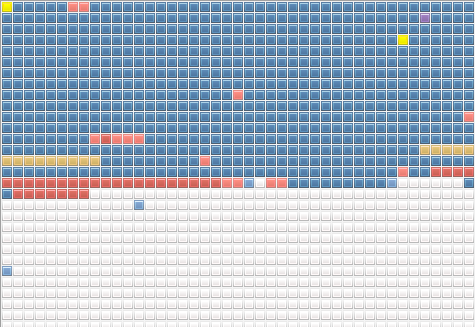 By definition those sentences are “fragmented.” They’re broken into fragments and strewn about. Would it slow down your reading if you had to go find the other half of the sentance, somewhere else on the page? Of course it would. It’s the same with your hard drive. Sometimes file A is on one part of your drive. File B, that’s always needed along with file A, or right after it, is clear on another part of the drive. That means the drive takes longer when reading those 2 files, every time it accesses them. Just like the sentence. So defragementing puts the sentence back together, or the files right next to each other. And then… you know what, nevermind! Just ask yourself this: do you like your computer to run fast? 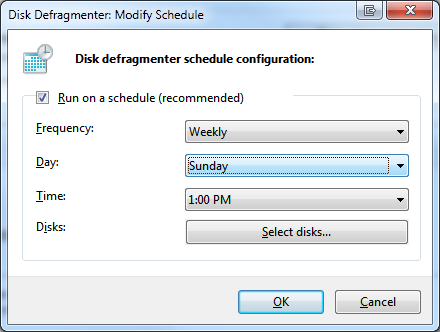 If so, then you should defragment semi-frequently. 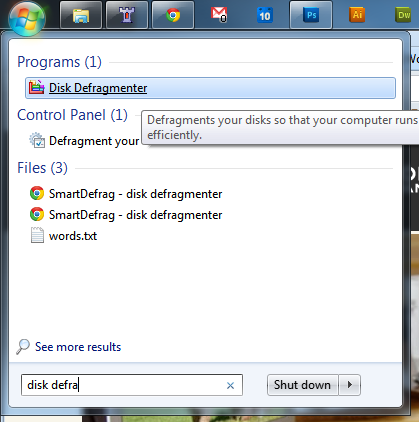 If you’re on Vista or Windows 7, just click start and type “defrag” in the search box. Some results will appear. 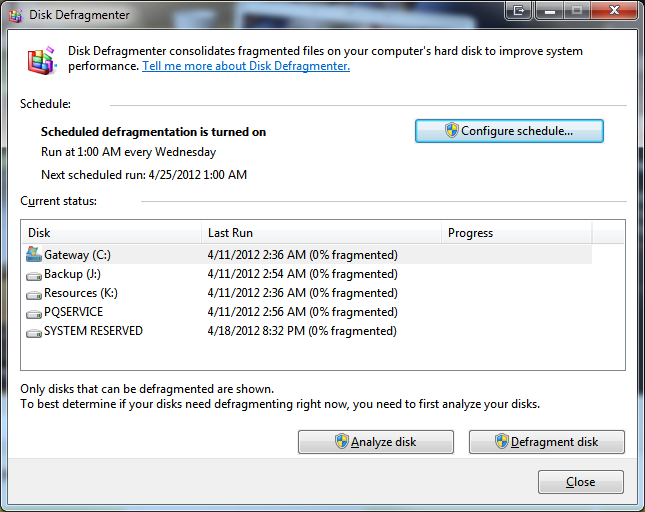 Click on “Disk Defragmenter” in the results to open it. Click the “Configure schedule…” button. Select your schedule. I recommend Frequency: Weekly; Day: Sunday; Time: whenever your Church starts. Now click “OK” and then the “Close” button. You’re done! Good to go. Defraggler is a free defragmentation software from Piriform that I feel does a better job of defragmentation in my opinion. 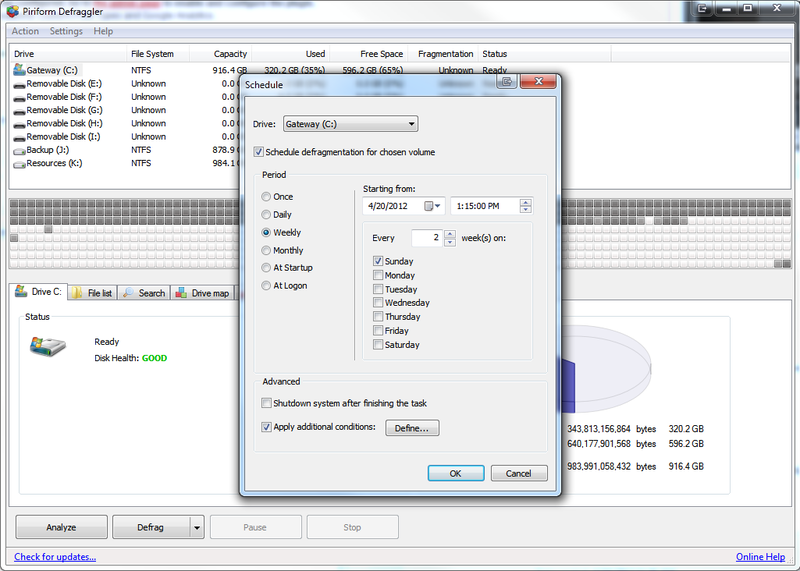 If you want to be more thorough, or set more specific scheduling, I recommend downloading it here and installing. Then setup similar scheduling settings under “Settings>Scheduling…” of course, and set them similar those I suggested above. Defraggler lets you get more specific though: I only have it run every-other week, and I set some conditions so it won’t run if I happen to be at home (say Stake or General Conference or I’m sick) and using my computer. See my screenshots in the last two images of the above gallery. There’s other things you can schedule to run as well: backups, other cleanup tools, and more. Mac users can benefit too, as there are some optimization type tools that help them out as well. We’d love to hear about anything you put on a schedule, especially if it would be beneficial to do while you’re at Church.